The Hawker Typhoon (Tiffy in RAF slang), was a British single-seat fighter-bomber, produced by Hawker Aircraft. 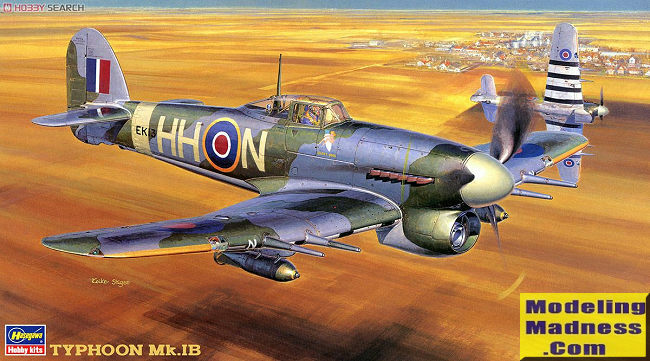 It was intended to be a medium–high altitude interceptor, as a replacement for the Hawker Hurricane but several design problems were encountered and it never completely satisfied this requirement. The Typhoon was originally designed to mount twelve .303 inch (7.7 mm) Browning machine guns and be powered by the latest 2000 hp engines. Its service introduction in mid-1941 was plagued with problems and for several months the aircraft faced a doubtful future. When the Luftwaffe brought the formidable Focke-Wulf Fw 190 into service in 1941, the Typhoon was the only RAF fighter capable of catching it at low altitudes; as a result it secured a new role as a low-altitude interceptor. Through the support of pilots such as Roland Beamont it became established in roles such as night-time intruder and long-range fighter. From late 1942 the Typhoon was equipped with bombs and later RP-3 ground attack rockets were added to its armoury. With those weapons and its four 20mm Hispano cannon, the Typhoon became one of the Second World War's most successful ground-attack aircraft. A major change in the airframe started with November 1943 production and aircraft serial JR333 when the 'car door' canopy was replaced with a clear vision bubble canopy. Many older variants still in service were retrofit but the upgrade required considerable modification to the airframe and the process was very slow with many aircraft assigned to 2 TAF still operating with the old canopy. 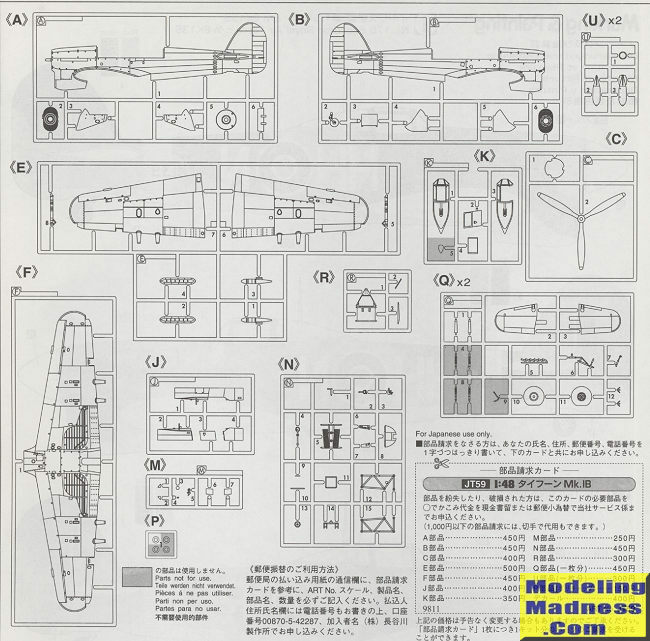 Other upgrades include rocket rails, first equipping squadrons in October 1943, a four bladed prop, and larger tailplanes being installed from early 1944. This boxing of the car door Typhoon IB comes from 1998 and I believe it is the basic boxing of this variant. The cockpit is nicely done with interior framework helping to make up the cockpit set. 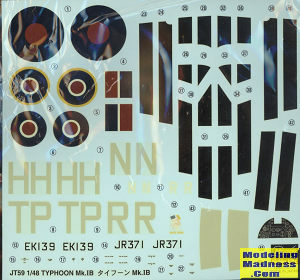 You get decals for the instruments if you don't wish to paint what is molded in place. Not surprisingly, there is a large insert for the upper fuselage to handle the differences between the car door and bubble canopy variations. Wings are a single lower section with upper halves. Holes in the lower wing need to be opened for the bomb racks, this kit not providing the rocket rails used later in the plane's career. I would like to think that this boxing also has the shorter tail planes as it does have the rear fuselage reinforcements. Gear wells are molded into the lower wings and the landing gear are nicely detailed. with actuators for the inner doors provided as well. Below the radiator bath is a separate exhaust door that can be posed open if you so wish. Wheels are flat spotted and you get shackles to go along with the bombs. The gun barrels are separate items. You get two separate canopies, one with a cut out if you wish to have the separate door open. For the closed position, a fully enclosed canopy and different door are provided. You also get both shrouded and unshrouded exhaust. The prop in this boxing is the three bladed version. Markings are provided for two planes. Both have the black and white stripes on the lower fuselage that were typical of this aircraft during this time. Hasegawa provides the black stripes and leaves you to paint the white area. THe box art plane is from 175 Squadron, while the second option, TP*R is with 198 Squadron. Both are painted dark green and ocean grey over medium sea grey. Decals are nicely printed and as long as you use hot water, should work perfectly. To my knowledge, this is it for a car door Tiffie in 1/48. Monogram did the later version and that is still a viable kit. Finding this one is not that difficult as a web search turned up a number of them in the $30-40.00 range.